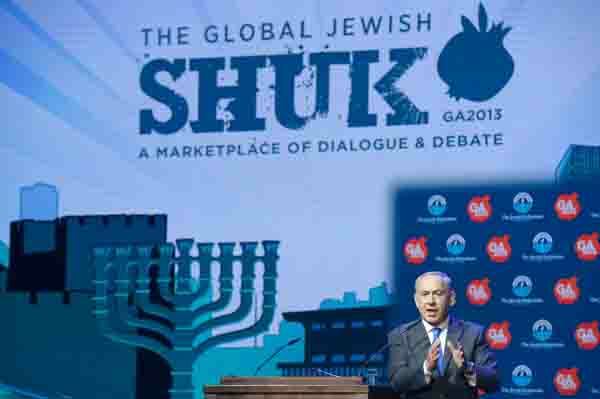 At the opening plenary, Prime Minister Benyamin Netanyahu delivered a loud, clear message: current negotiations with Iran are a mistake. Harsh current sanctions, he explained, have pushed Iran to the brink of financial collapse, and that has brought the rogue nation to the bargaining table. That day, the proposal that was on the negotiating table, Netanyahu insisted rewarded Iran with an easing of sanctions for coming to the table and did nothing to stop Iran’s nuclear program. It did not call for shutting down or dismantling the centrifuges that enrich uranium. It did not provide for on site inspections to verify Iran’s claims that their nuclear program is peaceful. And it did not halt construction on Iran’s heavy water nuclear reactor, which Netanyahu insisted, can only be used for making bombs and has no non-military purpose. The agreement might delay Iran’s progress for a few weeks or months, Netanyahu said, but would not stop it. This deal threatens the survival of the Jewish state, he said. In addition, it also threatens the rest of the world. Iran’s current rockets can reach all of Israel, yet it continues to develop longer range rockets, including ICBM’s, which the Israeli leader claimed, are designed to reach North America and could be nuclear tipped. Iran must be stopped, he reiterated. Netanyahu also briefly addressed another regional issue. “We also want to see peace with our Palestinian neighbors,” he said. He called for a simple historic compromise – two states for two people. The conditions are clear, he said. If the Palestinians want Israel to recognize their state for the Palestinian people, they must recognize Israel for the Jewish people. The Jewish State has the right to be here, he said without threat from rocket fire or destruction by a flood of refugees. He called on Palestinians to make the same kind of courageous decision Anwar Sadat did and say that they accept the Jewish State. In the second plenary session the next day, Israeli President Shimon Peres struck a much more conciliatory note on the topic of Iran. He called on the delegates to trust the United States at the negotiating table with Iran because President Barack Obama’s administration is as committed to keeping Iran from becoming a nuclear power as Israel is. In one breakout session, Rabbi Lord Dr. Jonathan Sacks, the former chief rabbi of Britain, said the Pew report presents an aggregate look at the Jewish community which doesn’t tell the whole story and thus paints a more negative picture than more in-depth analysis shows. The 71 percent out marriage rate reported in the survey is the realization of the dream of a melting pot society and opens the door to a broader Jewish identity, not necessarily defined by religious observance. “American Jewry can achieve anything it sets itself to do,” Rabbi Sacks said. In another breakout session, a panel of experienced and emerging Federation leaders saw the Pew report as a challenge and presented various programs they use to reach out to and engage younger Jews. In plenary speeches, JFNA CEO Jerry Silverman and Chairman Michael Siegal also shared their ideas, advocating directing more communal resources to expand Jewish preschools, day schools and camps, establishing mentoring programs to follow up with Birthright Israel participants and advocating that community leaders develop stronger personal connections with young Jews. There were also several calls for change within Israel to allow civil marriages and to allow for pluralism in the Jewish State.